Can you add model XYZ, or wind level X, etc.? Possibly. Many of the features on SpotWx were added by user request. What's coming next on SpotWx? 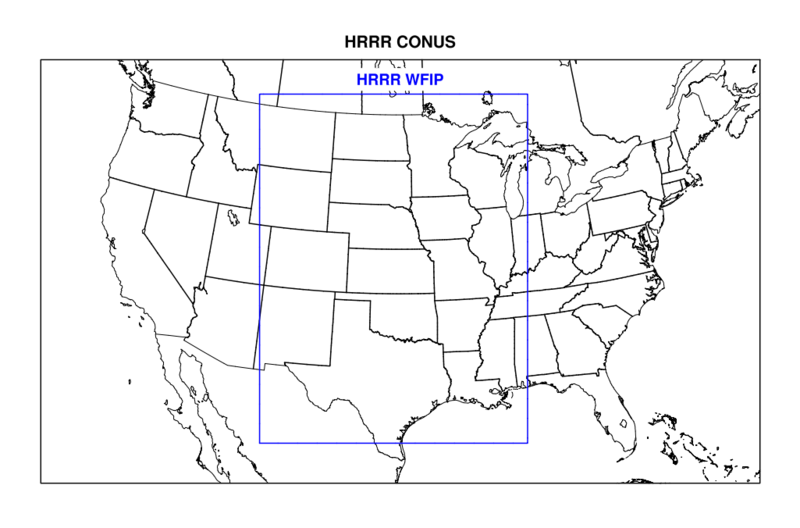 What is a Numerical Weather Model? Numerical Weather Models are often the first layer of the weather forecasting cake. 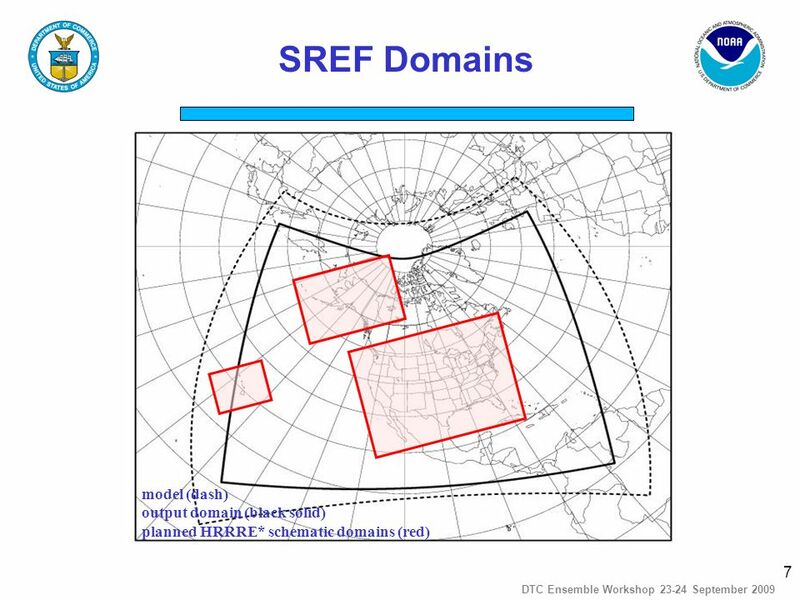 Several times a day, weather service computers are crammed full with all the latest surface, upper air, radar and satellite weather data, then they whir and shake for a while as a complicated mathematical model is applied, and eventually they spit out forecast weather elements for an evenly spaced grid over the Earth. The forecast at this point has not been adjusted by any humans. Pros: The grid coverage allows for the creation of forecasts at any location within the model (i.e. your favorite fishing spot), not just for the nearest town or city. 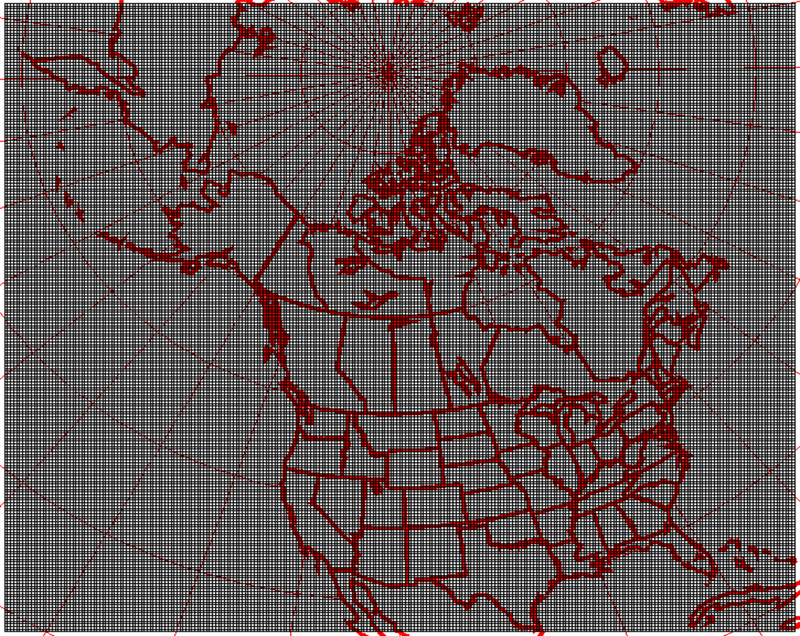 The grid coverage also allows your local TV station to make those fancy maps. Cons: Your Spot may not be properly represented by the model grid cell in which it falls. The average elevation of the model cell may not represent your Spot elevation, or the cell may fall mostly over water while your Spot is over land. Zoom in on the map when selecting your Spot to view the extent of the model grid cells. The model elevation and land proportion is also shown below the forecast graphs. Read more about numerical models in Wikipedia. Geographic Extent: Much of North America, from central Mexico to around the 60th parallel. Forecast Range: 21 hours, in 1 hour increments. Geographic Extent: Much of North America (solid line on this map). References: NOAA link for details. Forecast Range: 18 hours, in 1 hour increments. Geographic Extent: Lower 48 states and southern Canada (CONUS coverage on this map). Forecast Range: 87 hours, in 3 hour increments. 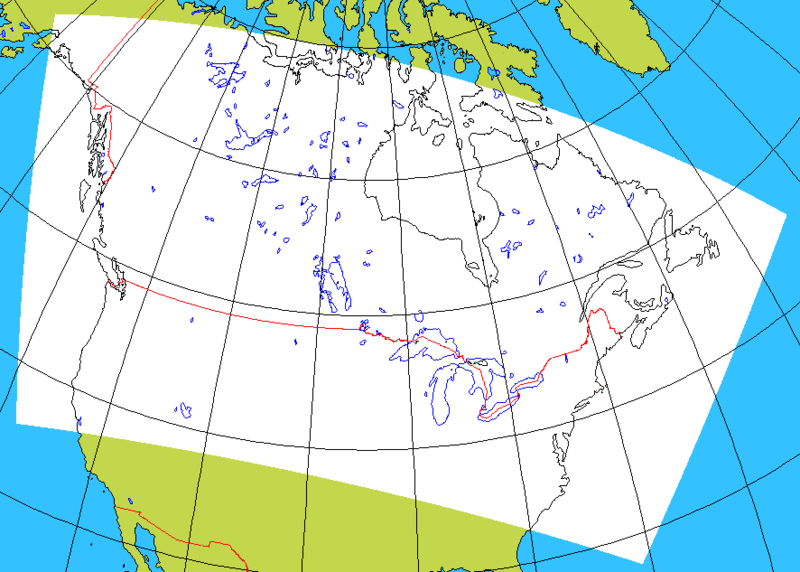 Geographic Extent: North America, plus a bit (Solid black line on this map). References: Environment Canada link for details. What is the SCRIBE Matrices forecast? SCRIBE Matrices are specific to Environment Canada, used to help produce the public forecast. Data is extracted from the numerical weather models for specific locations across Canada, known as SCRIBE points, then automatically adjusted for known biases and local weather effects. Each public forecast zone has at least 1 SCRIBE point, and the forecasters use this data when creating the public forecast. The SCRIBE Matrices are also known as 'uncorrected SCRIBE', as they have not yet been modified by a human forecaster. Pros: Should produce a better forecast than the Numerical Models at the SCRIBE locations. Cons: Is only available at the SCRIBE points, which may not provide a suitable forecast for your Spot location if it's a distance from the SCRIBE point or over different territory. The Nowcast is another product specific to Environment Canada. It was developed to assist forecasters when producing the public forecast. The Nowcast relies on recent observed weather (surface, lightning and radar data) to extrapolate 12 hours into the future. As it doesn't use the Numerical Models as an input, the Nowcast is seen as an independent source for verification. In fact, it is often more accurate than the SCRIBE data for short-term forecasting. Nowcast locations are usually the same as the SCRIBE points, but not always. Pros: Updated hourly, and forecasts ahead in 1 hour intervals. Often more accurate than the SCRIBE data for the short term (1-6 hours). Cons: Only forecasts 12 hours ahead. Like SCRIBE, it's only available at set locations. As it doesn't reference the model data, the Nowcast can easily miss developing systems and rapid changes. Always reference the Nowcast against another product. Meteocode is the detailed hour-by-hour numeric version of Environment Canada's public text forecast. It's also known by some as the corrected or adjusted SCRIBE. Environment Canada derives the short term Meteocode for each region by taking the forecast data from one or more representative SCRIBE points with the region, and adjusting it based on expert opinion. The public text forecast products you typically read are then automatically produced by a computer based on these Meteocode values. The text takes priority over the exact accuracy of the raw numbers. As such, certain forecast elements are fashioned to make the text read as desired (i.e. winds are unusually steady over many hours, change direction suddenly over a single hour, and only occur in increments of 5 or 10 km/h, or the probability of precipitation is high for many hours but there is no precipitation amount). So keep this in mind when comparing the Meteocode to other products. It is my understanding the Environment Canada forecasters are allowed to adjust values in the short-range (48hr) Meteocode, however the extended Meteocode (and consequently the extended Public Text Forecast) is purely an automated product. Is the Meteocode any 'better' than other products? That depends, and is a subject for a much longer discussion. Pros: The short-term Meteocode has been viewed and quite possibly adjusted by a human forecaster. As such, it is generally believed to be more accurate (assuming the forecast zone is representative of your location). The short-term Meteocode is also amended as required, while the numerical models only update on their set schedule. Cons: Your Meteocode forecast region may not properly represent your Spot. For example, some regions are quite large and may include both coastal and inland locations. The region may only have a single SCRIBE point located on the coast, in which case the Meteocode forecast is likely biased for coastal conditions. In this case, if your Spot is inland you should always consult other forecast sources for comparison. This is just one example, but you get the idea. Also, during the Meteocode assessment process, more points were given for accurate forecasts in urban locations, so rural users should also pay extra attention to other sources such as the numerical models. Disclaimer: The source Meteocode data does sometimes have exceptions for certain elements based on your general location within the forecast region (i.e. different temperatures or winds inland). However SpotWx is currently not displaying these exceptions. Consult your public text forecast (link) for the official public forecast. Below are the approximate update times, varying daily by about 15-30 minutes based on data availability.